In 1991, the US Fish and Wildlife Service (USFWS) was petitioned to list spectacled eiders under the Endangered Species Act (ESA). Due to their significant population decline and increased vulnerability at low population numbers, the USFWS listed the spectacled eider as threatened throughout its range in Russia and Alaska under the ESA in 1993. Critical habitat for this species was designated in 2001. 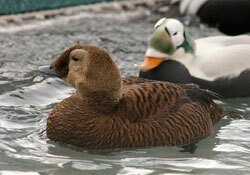 For general information on Spectacled Eider, see the Spectacled Eider species profile page.